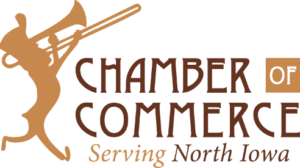 This annual award recognition, held October 3, 2019, will celebrate the Chamber's 103rd anniversary. Projected attendance is 275-325 business people. This annual event highlights the organization's accomplishments and recognizes individuals, businesses, and organizations for various achievements. This luncheon event features "A Taste of North Iowa." Website and Hosting By WebWise Solutions.